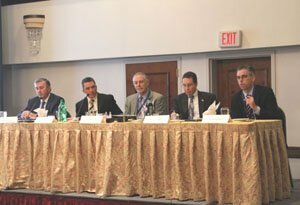 Long Island School Safety Forum hosted by A+ Technology and Security Solutions draws 100 school administrators and addresses security challenges as well as best practices. MELVILLE, NY; JANUARY 15, 2013 - In the wake of the Sandy Hook Elementary School tragedy and string of threats to Long Island schools and students, nearly 100 administrators from K-12 schools, school districts and institutions of higher education recently attended the School Safety Forum: Transforming Our Schools, Violence Prevention and Crisis Planning, an educational program and luncheon that was hosted by A+ Technology and Security Solutions, a nationally respected leader in school security technology and systems. "We hosted this event to discuss school security topics with local school administrators. These individuals are faced with a daunting task of protecting children, facilities and assets 24/7, 365 days each year. At this forum we discussed challenges and also outlined best school security practices. It was important for us to provide this information now as well as educate administrators about currently and future school security technology solutions," David Antar, President of A+ Technology and Security Solutions. According to panelist and District Superintendent of Nassau BOCES, Dr. Thomas L. Rogers, "Despite financial obstacles and other challenges, security must be priority for schools and school districts. Forums like this help us learn what different districts are doing effectively and share ideas on what works. All individuals involved in education need to be vigilant and find effective ways to protect our students, faculty, staff and facilities." The School Safety Forum event kicked off with a keynote address from former head of New York State homeland security Michael Balboni. Mr. Balboni discussed a number of pressing school and related security issues as well as the legislative process. The panel, moderated by Michel Richez, Director of Business Operations & Development of A+ Technology and Security Solutions and former Director of Technology and Information Services for Long Beach School District, included a discussion with Superintendent Nassau BOCES Dr. Tom Rogers, Superintendent of Connetquot Central School District’s Dr. Alan Groveman, retired NYPD detective sergeant and President of Covert Investigations school security consulting firm’s Don Flynn, and A+ Technology and Security Solutions President David Antar, all of whom presented strategies and addressed issues related to school security. The discussion also included concerns related to Long Island school security and lessons learned from the recent Sandy Hook Elementary School tragedy. Budgetary concerns, mental health and new school security technology were among the highlighted topics. Additionally, A+ Technology and Security Solutions provided a first-hand look at innovative school security ideas and approaches, providing demonstrations of the latest in technology. The company plans to host similar events on Long Island and in the New York region in coming months. For information, visit www.theaplusgroup.com. For event photos, click here. A+ Technology and Security Solutions is the leading provider of IP Surveillance and Convergence for K-12 schools and school districts in New York State. The company designs, installs and offers Fusion Center - Physical Security Information Management (PSIM) solutions for a diverse client base which includes Fortune 500 companies, K-12 schools and government agencies. Company’s clients include ConEdison, Suffolk County Police Department, Yonkers Public Schools, Fordham University, Stony Brook University, Lockheed Martin, Brookhaven National Labs, FDNY, Panama Ports, MacArthur Airport, the United States Embassy in Honduras, and the United States Department of the Navy. A+ Technology and Security Solutions’ systems and solutions empower organizations to proactively mitigate security risks, while maximizing return on investment. Headquartered in Bay Shore, NY the company has research and development offices in Punta Gorda, FL. A+ Technology and Security Solutions continues to grow as a leader in IT, audio/visual, security and instructional technology and welcomes any visitors to its 18,000 square foot research and development facility in Bay Shore, NY. For more information, visit www.theaplusgroup.com. Subject: LongIsland.com - Your Name sent you Article details of "A+ Technology and Security Solutions Hosts 100 School Administrators at School Safety Forum"